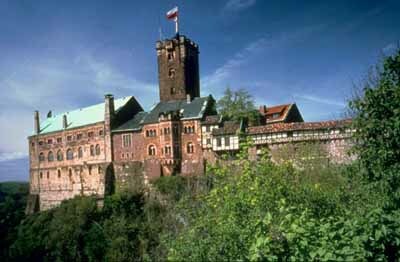 The Wartburg Castle, located on a hill, was founded by Count Ludwig of Thuringia in 1067. Saint Elisabeth, daughter of King Andrew of Hungary, lived in the Castle from 1211 until 1228. Martin Luther translated the New Testament into German during his exile at the Castle from May 1521 until March 1522. In the 19th century the Castle was reconstructed into the original style.